One of our top houses asked us for auctioneer comments on two Proxibid issues–the current bid increment and a $500 fee to change it. We’re happy to look into this, to provide some feedback, because we want our auctioneers to be happy and Proxibid to thrive! A consignor (not Proxiblog) asks an interesting question, as it relates to coins and especially bullion, concerning bid increments. They jump to $5 at the $25 lot level, $10 at $100 and $25 at $250. At the $1000 lot level, the increment rises to $100. 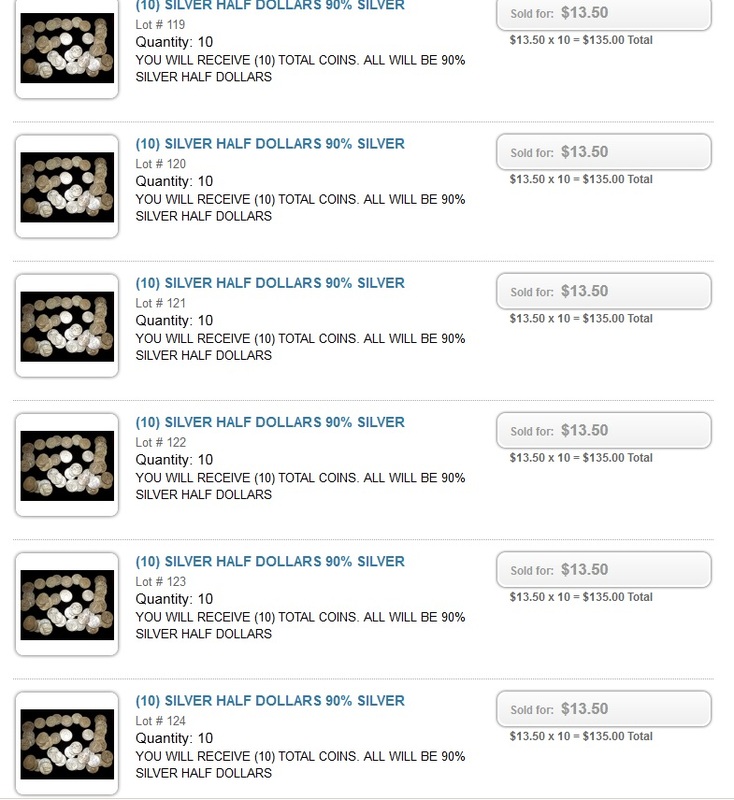 If the melt price of silver is $29 per ounce, the buyer has to bid $25, assuming the auction has a premium of 15% plus shipping, to get the coin a tad under what is the local coin shop going price. Nobody is making money. If the increment rises to $30, at the $5 jump level, the cost of a $29 chunk of silver rises to $34.50. Add shipping, and that’s a $5 premium. If the melt price of an ounce of gold is $1600, and the bid increment $100 with a 15% buyer’s premium, all you’re doing is guaranteeing the onsite crowd will score the winning bid, because an Internet buyer will pay more than $1850 with premium, insurance and shipping. Sell to the onsite buyers, and Proxibid loses its commission. And with a $500 fee to change the bid increments, the auctioneer is footing the bill again. We asked some of our auctioneer friends to weigh in on this, and their comments are enlightening. One says that each auctioneer can set her or his own bid increment schedule. The $500 fee is charged only to change the increments once a bid slate has been established. “I used to auction on iCollector and the user could change the increments with every auction, which was a nice feature,” the auctioneer says. “I have set my increments low for the reasons you mention. We wrote about bulk bidding in an October 2012 post. Auctioneers have suggested to Proxibid that if the company cannot change the increment table across the whole portal they at least need to change it in the Coins & Currency category because these tables are really crucial to buyers and sellers alike. What does Proxiblog think? First, we know all about technology. We know all about media. We know that computer program changes cost time and money if the in-house technology does not allow for automatic bid increment table switches, which it should, by the way. The company would need to set up its administrator system so that the auctioneer is responsible for the changes, which would be a nifty feature, because the bid increment should change with the nature of the lots–just as it does in a real auction, according to estate. But let’s say the bid increment fee is legitimate and the company isn’t making any profit by allowing the switch. Then the responsibility falls on the Proxibid sales team to advise the client, rather than just sign clients up. We’ve put the burden on the sales team before in previous posts. A good media sales person or account manager not only knows the in-house technology but also what would work best for the client. The standard increment just doesn’t work well for coins. We also know that Proxibid does listen to feedback. In a perfect world, a true partnership between company and client would be for both to make profit by helping the buyer get the best deal in a win-win-win situation. That calls for flexibility in the increment table … or at least a little counseling on what works best in the Coins and Currency category. How about you? Would you like to weigh in on this and provide your feedback by making a comment? As always, we ask that you remember this is an educational site and not a complaint board and that Proxiblog wants all parties to thrive in that win-win-win partnership. This entry was posted in News, Uncategorized and tagged American Numismatic Association, Auctioneers, AuctionZip, Best Practices, bid increment, Coin Auction, iCollector, National Auctioneer Association, Proxibid, Proxiblog. Bookmark the permalink.